Midwest Rapid Tool Inc. has developed Tool Holders which accept industry standard ER 20 collets. This enables one Tool Holder to be able to accept tool bits with diameters of .018" to .511" with the appropriate collet. Collets are available in either imperial or metric sizes. 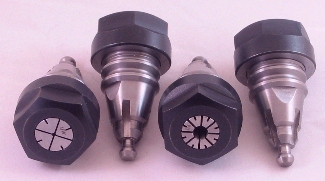 Any standard ER20 collet can be used which meets the DIN6499 spec. The collets offered by Midwest Rapid Tool are made from alloy spring steel and are fully hardened. All critical surfaces are precision ground for accurate fit. Each collet has a full .039" range of collapse while maintaining full accuracy. Tools will not get stuck in the Tool Holder due to the self release design built into the collet nut. 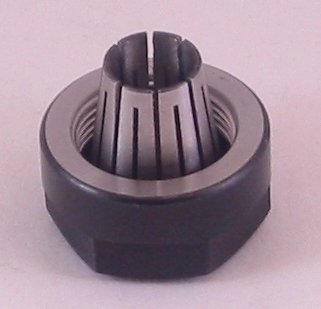 The assembly consists of a Tool Holder, collet, and collet nut. It is very important to first insert the collet into the collet nut before starting the collet nut on to the Tool Holder. 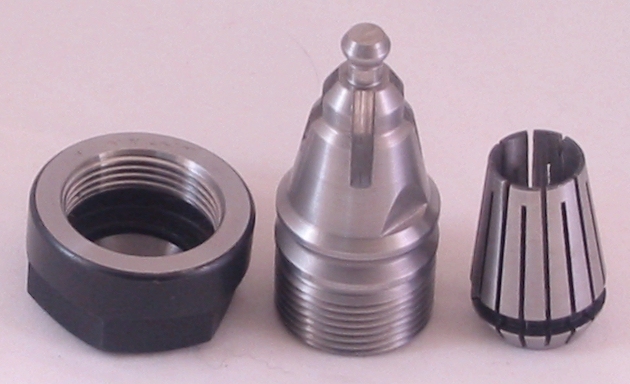 If this is not done, damage to the collet, collet nut, or Tool Holder could result. The taper on the tool holder is machined to match the original taper on the Porter Cable collet chuck so the standard PC collets may still be used when a holder is not available for bits which are used infrequently. The Porter Cable collets are available from many sources either on the internet or a local supply house. The collets are available as either a boxed set or individual collets. With a box set, the Tool Holder can grip any size tool bit or drill within the range of the assortment. For the English set this is .025" to .500". For the Metric set this is .018" - .512". The English collet set includes a 3/32, 1/8, 5/32, 3/16, 7/32, 1/4, 9/32, 5/16, 11/32, 3/8,13/32, 7/16, 15.32, and 1/2" collets in a wooden box. 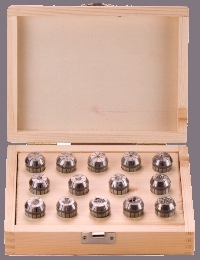 The Metric collet set includes a 1mm, 2mm, 3mm, 4mm, 5mm, 6mm, 7mm, 8mm, 9mm, 10mm, 11mm, 12mm, and 13mm collets in a wooden box. Individual ER20 Style Collets available from Midwest Rapid Tool Inc.